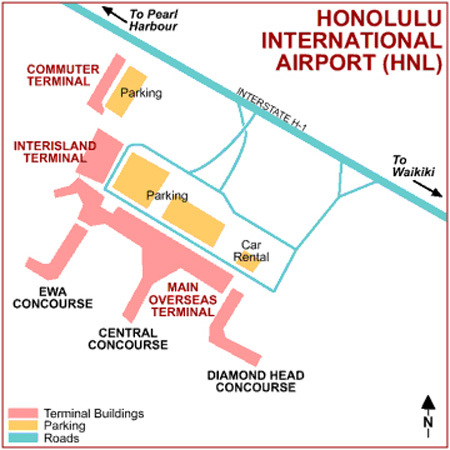 You might be surprised to learn that Honolulu International Airport, also called HNL, is a pretty busy airport. In fact, it is one of the busiest airport in the United States with over 20 million passengers a year. After all, who wouldn't want to catch a flight to paradise? But don't worry, this is only statistics. When you get off the plane and you discover the Honolulu Airport, it feels just like a small local airport. Instead of the plain and boring usual loading bridge, you are welcomed by the warm hawaiian sun and the cool breeze of the sea. You feel the Aloha right away! I will always remember this moment when, waiting in line for the US Customs agents to check my carry on bag, I suddenly heard the cool sound of a ukulele filling the place. The three members of a small traditional band were playing and singing along, 'Hawaiian style' with big smiles on their face. The atmosphere was surreal. I could not believe I was in an airport! This might sound 'cliche' but I actually felt totally welcomed here. The effect was so contagious, even the Customs agents seemed friendly to me! 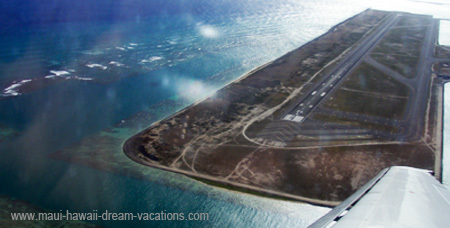 One of the four Honolulu Airport runways is called the Reef Runway. Built entirely offshore, it is 12,000-foot long. Seen from the air, it looks like it's floating on the surface of the sea. 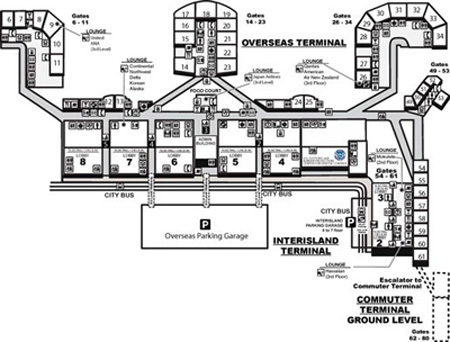 This is the central overseas terminal's departure area serving U.S domestic and international destinations. This terminal is serving the interisland flights and some Hawaiian Airlines' US Mainland flights and Departing International Flights. 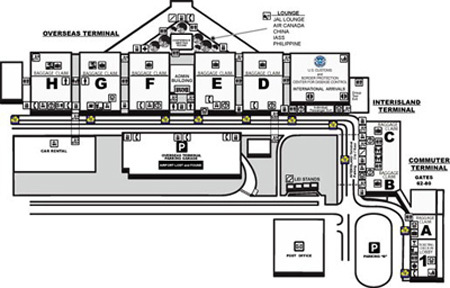 Visit the HNL official Website to download a PDF version of these maps. If you haven't bought your tickets yet, read my advice on how to book a cheap flight to Hawaii with one of these Airlines. Hawaiian Airlines is the largest Hawaii-based airline. Almost half of the seats offered at the Honolulu Airport come from Hawaiian. If you are planning to visit Maui or another Hawaiian island, chances are you will fly with this Airline. Read this page to know more about Hawaiian airlines. Follow this link to get additional info on interisland flights.